Mine got lost in the mail. Everyone received their copy weeks earlier. I wasn’t even sure what I was waiting for but I was convinced it was special because it was coming from Bob Schelfhout-Aubertijn. Before Bob left Bilbao, Spain and the Mendi Mountain Film Festival for home in The Netherlands, he had asked a few friends for their current address. I gave him mine right away. Whether it’s in Banff, Canada, Kendall, United Kingdom, Bilbao or someplace else, the mountain film festivals bring the climbing community together, and their reach goes beyond the gatherings at climbing events like the Ouray Ice Festival or Red Rock Rendezvous. Active climbers show up at the climber meets, but active climbers, artists, filmmakers, authors, and armchair mountaineers go to the mountain film festivals. The postcard I received was an illustration of the broad gathering at Mendi, and also its status. After some prolonged waiting, I got mine. What we all received was a picture of the Guggenheim Museum, which was near the Mendi festival that was held all over Balbao. 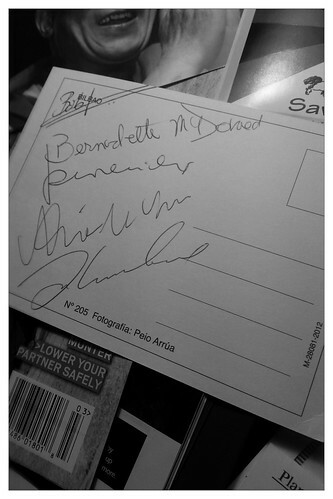 On the other side there was no message, only the signatures of four extraordinary members of the climbing community: Award winning author Bernadette McDonald, legendary Polish alpinist Krzysztof Wielicki, Polish climbing star Adam Bielecki, and leading Kazakh mountain climber Denis Urubko. Most of their marks were barely readable. At the top, in the return address space, signed with only his first name, is Bob himself. He and I joked about how it devalues the postcard’s value with the other four autographs (how it’s gone from several hundreds of dollars to mere cents with his pen stroke). In reality, in my opinion, Bob has played a valuable role in telling and retelling some of climbing’s greatest tales. He is a historian with a incredible memory for detail and he has a collection of climbing autographs and memorabilia you might not believe. Yet, his name only appears in footnotes in some of the books and periodicals you might read, particularly from National Geographic and Alpinist. The fact that Bob thought to send me one of his several signed postcards from Mendi has sent me soaring. When I learned the other recipients I blushed; those I knew are people that I admire. It was good company. Thanks, Bob, for making me feel like a part of your community. The biggest and saddest news from the past couple of weeks has been the loss of Chad Kellogg, the well known speed climber and less well known alpinist. He ascended Fitz Roy’s Northwest Ridge with Jens Holsten and was killed by rock fall on the descent in the Supercanaleta, only three rappels below the summit. Jens descended alone. I didn’t want Chad’s story to be over yet. The opposite side of the coin of sadness yielded this development: The same week Kellogg was lost, American rock climbers Tommy Caldwell and Alex Honnold tried some Patagonia alpine rock and were the first to complete a full traverse of the Fitz Roy massif via a unified ridge with an ascent of 4,000 meters. It’s been dubbed the Fitz Traverse. Several climbers continue to work toward making the first winter ascent of Nanga Parbat. As March 21 looms, the ascent just gets more exciting. Raheel Adnan has been covering the details on his blog, Altitude Pakistan. I also post much of his material on my Twitter feed. Lastly, I conducted a few brief interviews with some of the leading climbers in Alaska today and asked them about some of the boldest ascents to remember. Well, it’s not pretty, but the list is longer than I thought it would be and the climbs are more daunting than I originally considered them (when the leaders are impressed, you have to be more scared than they are, right?) So look for the first post on that later this month.